This year I attended my first gaming event – Play Expo 2014, hosted by Replay Events at EventCity in Manchester. It promised a huge variety of retro games/consoles, classic arcade units, indie developers, special guests, movie props, pinball tables and more! Did it deliver…? Upon entering the event, visitors were greeted by a display of Bumblebee and Jazz from the Transformers move, as well as the legendary DeLorean from Back to the Future. There were loads of really cool shops selling a variety of collectables from figurines to retro games and consoles. I picked up a brand new/sealed figure of Marcus Fenix from the Gears of War series for just £2! Absolute bargain! A lot of the games were on the pricey side compared to eBay, but there were still some great deals to be found. I missed out on a CiB copy of Moonwalker for a decent price, but I did manage to get a couple of other classics which have been on my wishlist for a while. The general buzz/atmosphere here was fantastic. I was surprised by the number of people participating in cosplay and the quality of their costumes/appearance! Everyone I spoke to was really cool and friendly, adding to the overall positive experience. Another bonus to having so many gamers in one place was SpotPass for my Nintendo 3DS! Me and my friend brought our consoles to the event and kept maxing out our connections! I reached a point of about 50 and had to stop as it was taking too long to process them all. I really wish Nintendo would lift the limits beyond 10! I wanted more puzzle pieces!!! One major downer at the event was the fact I couldn’t get ANY signal in or around there for my phone or any kind of 3G/WiFi connection. This meant that I had no means to contact friends/followers on twitter to arrange meet-ups, so I missed out on catching up with some really cool people. Next year I’ll have to try and arrange things in advance, unless this gets resolved. (I know this isn’t a highlight, but I needed to mention it somewhere). There were quite a few indie developers at Play Expo, some I’d never heard of before. I got to chat with them and make some new connections which was great, but I also got to try out some fantastic upcoming games! I wanted to make a video or separate article about these, but I’m currently awaiting some press kits/resources. I’ll hopefully have more info soon! 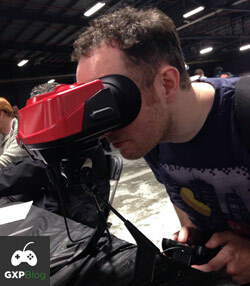 I’ve seen and read a lot about the Virtual Boy; one of Nintendo’s biggest failures. The console’s 3D visuals and red screen unfortunately gave a lot of people headache’s – similar to the early launched of the Nintendo 3DS. However, I was lucky enough to not be affected by this. I got to sample a great little Mario Tennis game which resulted in me REALLY wanting to add one of these to my collection! Hopefully one day I’ll get my hands on one. 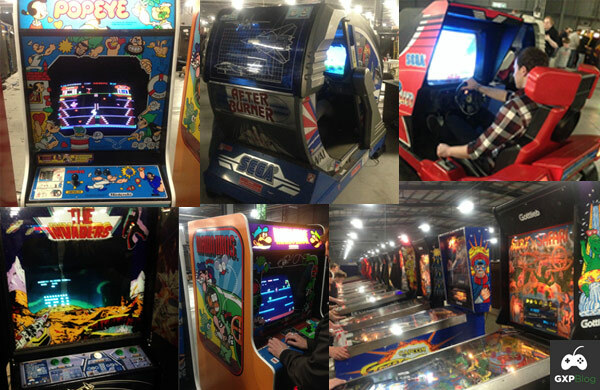 Now onto what was probably my biggest highlight – the arcade units! There were well over 200 free-to-play classics such as Donkey Kong, Pop-Eye, Space Harrier, Teenage Mutant Ninja Turtles, Mortal Kombat 2, Operation: Wolf, and two of my favourites that I just have to mention: Outrun and After Burner! As soon as I saw these it was like being a kid all over again. I was so excited! Playing them brought all the fantastic memories back and I loved every minute of it! Situated next to the arcade cabinets were a whole host of classic and vintage pinball tables! Unfortunately I didn’t get time to play on these, nor did I get to sample a lot of things from the event. I really wish I could have stayed for both days, but unfortunately it was not possible for me. There were loads of games to play, trying out the Oculus Rift, competitions, celebrities to meet, and so much more that I couldn’t fit in to just one day. If you’re into retro gaming or just gaming in general I highly recommend you go. Me and my friend had a fantastic time and I can’t wait to go again next year!